One hundred years ago today, on the 11th hour of the 11th day of the 11th month, the “War to End All Wars” finally ended. Through your direct support for Sgt. Stubby: An American Hero – with every ticket stub, DVD purchase, group screening, and craft project – you continue to show the desire for substantive, true storytelling in the family entertainment industry. You reaffirm our commitment to finding new ways of engaging kids with history, despite the common misconception that children aren’t interested in the past. And, most importantly today, you have ensured this important chapter in history will be remembered for generations to come. WHY DOES WORLD WAR I MATTER? In the United States, the First World War tends to be overshadowed by its more popular sequel. The U.S. was only involved directly for the final year of the conflict; why should we care? For starters, World War I represents the first time the United States – a collection of 48 distinct and diverse regions – were all truly united under one flag, given one uniform, and deployed en masse onto the global stage. The new American Expeditionary Force was charged with creating a functional team of well-trained, highly-motivated soldiers out of a citizenry that lacked a unifying civic identity: children of Civil War veterans from both sides, First Nations people carving a place for their cultures to survive, farmers who had never traveled beyond 30 miles from their birthplace, former slaves and recent immigrants still trying to find their footing in the industrial jungles of the New World. In the midst of all this, an insignificant stray dog with a stubby tail searched the streets of New Haven, Connecticut for a meal and a (hopefully warm) place to sleep. 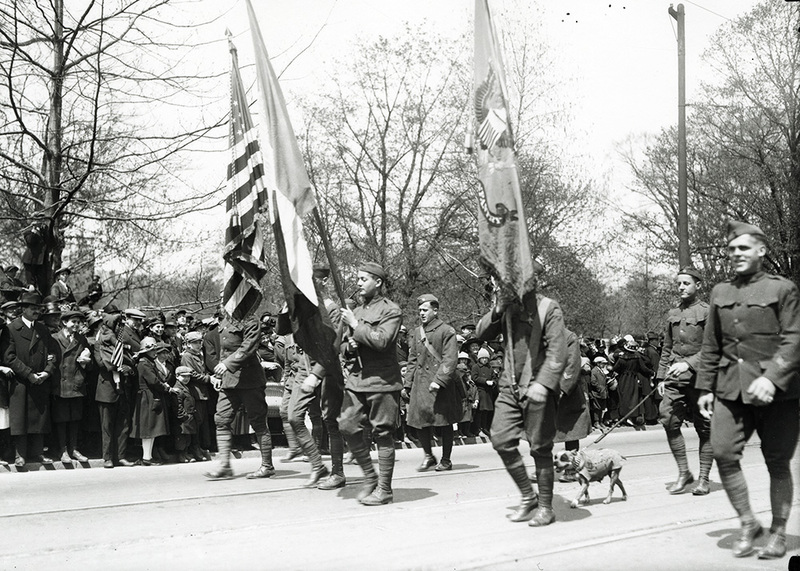 Over the next two years, the little dog “Stubby” would find himself transported across the Atlantic Ocean, dazzled by bright Parisian lights and loved unconditionally by the men of the 102nd Infantry Regiment; he would also find himself detecting incoming attacks, dodging German artillery while searching for wounded Americans on the battlefield and saving countless lives through his dedication and bravery. 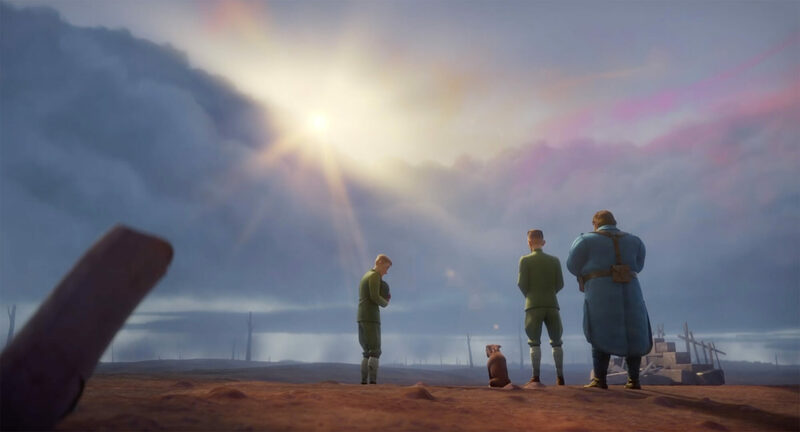 In many ways, Stubby’s story is a microcosm of the American experience in World War I, the story of an unspectacular mutt lacking fancy pedigree or military experience who, when faced with overwhelming odds, performed spectacular feats of valor in the service of his friends. As beneficiaries of this legacy, we are responsible for exploring this part of our collective past. Sgt. 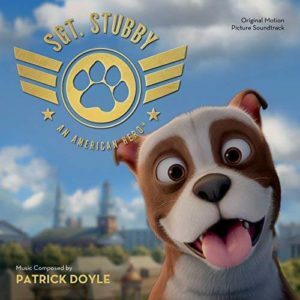 Stubby: An American Hero provides a “dog’s eye view” of history for all ages to experiences, giving modern audiences a glimpse at a world that most Americans had never dreamed existed prior to 1916 – and most people today forget ever happened – from the point of view of a very unlikely hero. Every November 11, we celebrate Veterans Day in the United States to honor all veterans: current and retired, living and deceased, those who saw combat and those who served during peace time, active duty and National Guard/reservists. The day is intended to celebrate and, whenever possible, thank them in person for their willingness to serve under any circumstances. Around the rest of the world – especially in the United Kingdom and Commonwealth nations – November 11 is known as Remembrance Day and focuses on the fallen. The red poppy symbol comes from the poem “In Flanders Fields,” written by Canadian physician Lieutenant-Colonel John McCrae and inspired by the Second Battle of Ypres in 1915. Also celebrated in May, Armed Forces Day is dedicated to those currently serving in all branches of the military. The Army, Navy, Air Force, Marines, Coast Guard, and Army National Guard components also celebrate their individual holidays.